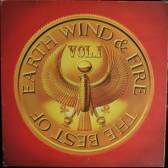 Earth, Wind & Fire - The Best Of Earth Wind & Fire Vol. I 12"
Issue with lyric inner sleeve. Gatefold cover. Some covers are gold stamped as promotional.